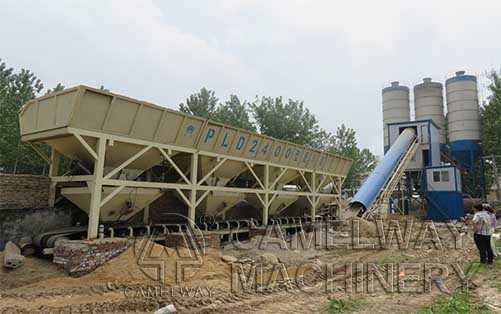 As a professional manufacturer and supplier of stationary concrete batching plants , Zhengzhou CamelWay Machinery manufacture would like to tell you the working process of 60m3 concrete batching plant. The first step is to put the aggregate into aggregate batcher by loader. Then weigh them on weighing hopper. Thirdly the operator should put them into the hopper of mixer by conveyor. As for cement and water, firstly they should be fed into cement weighing hopper and water weighing hopper by screw conveyor and water pump respectively. Secondly the operator should put them into mixer after weighing. The mixer begins to work after all the materials are ready. The operator can carry away the concrete after mixing. This entry was posted in Thailand Batching Plant, Turkey Batching Plant and tagged Concrete Batching Plant by camelway. Bookmark the permalink.